Right now this is my go-to smoothie combo. If I could, I would have it for breakfast, lunch and dinner. And I just can’t stop raving about it! 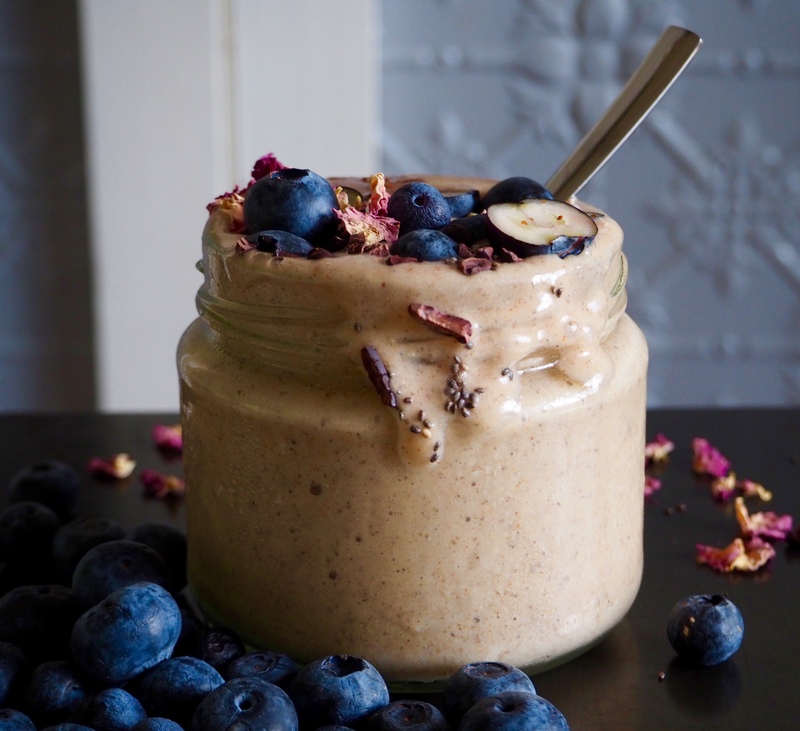 Apart from telling all my friends various times, I also thought I better not let you beautiful readers down and give you this super quick and luxurious smoothie, so you too can rave about it. 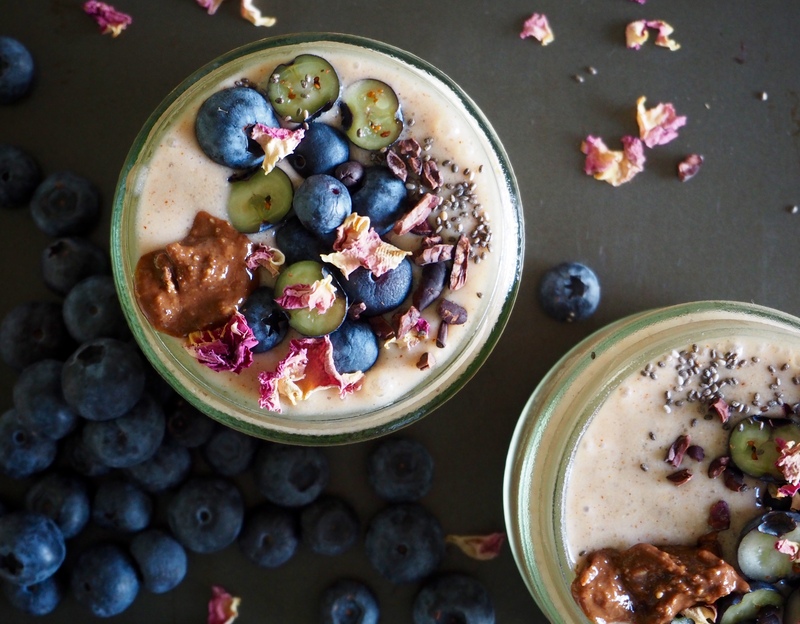 It’s packed with almond butter and chia to make it super thick and creamy while also providing you with a generous dose of good fats and a complete source of protein. Cacao powder adds a rich but subtle chocolate taste while also being a great source of magnesium, calcium, zinc, iron and potassium. Maca powder is an ancient vegetable that is great for balancing hormones, relieving stress and boosting energy with a delicious malt flavour. It is best to start with a little if you have not had maca before and gradually increase the amount to suit your taste. These ingredients really make this a super feel good smoothie far any day of the week! Plus blueberries and bananas, could it get any more super?! Dried rose petals, chia, cacao nibs and almond butter, to serve if desired. Measure and place all the ingredients, except the blueberries, into the blender in the order listed. Blend on high for 1 minute or until thick and creamy. Pour into 1 large bowl or two smaller jars and pop into the freezer for 5 minutes. The chia seeds will gel and make the smoothie extra thick. Meanwhile wash your blueberries and slice some in half. Prepare any other toppings you wish to include. 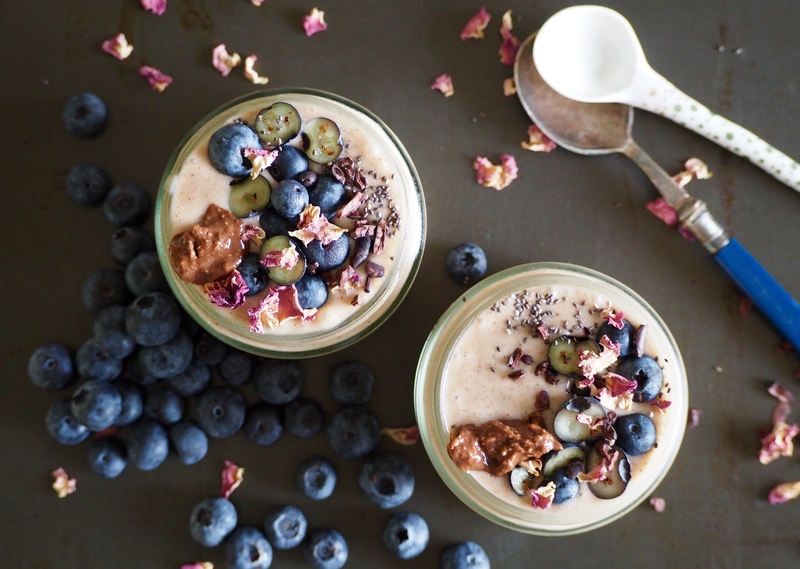 Remove the smoothie/s from the freezer and top with the blueberries and (almond butter, chia, rose petals and cacao nibs). This smoothie needs a spoon!